Break out your iPhones and snap a shot of yourself because Levi’s is looking for new faces to represent the company’s Go Forth philosophy. And, get this, candidates are to submit their images via my favorite photo app, Instagram. 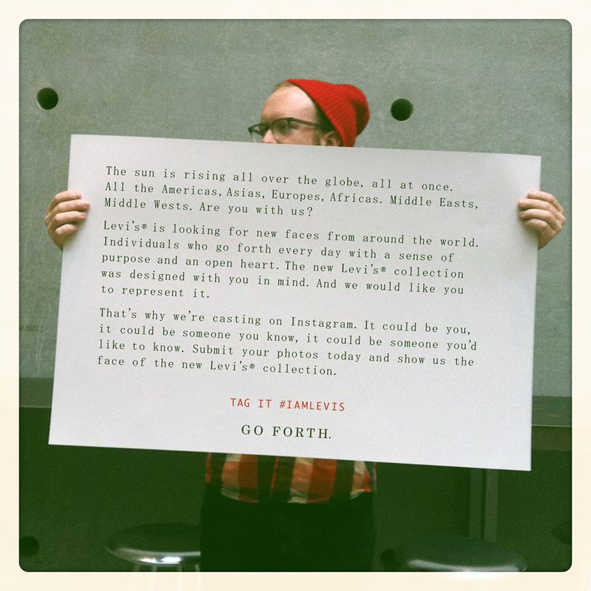 Submit your photos on Instagram, tag it #IamLevis and maybe you will be the new face of Levi’s iconic brand. This entry was posted on Monday, January 9th, 2012 at 4:22 pm	and tagged with #IamLevis, Advertising, Denim, Go Forth, Instagram, Jeans, Levi's and posted in Fashion, Good Causes. You can follow any responses to this entry through the RSS 2.0 feed.